What is better than sitting out on the front porch overlooking the street and enjoying a nice cool lemonade on a summer afternoon? Or perhaps, a hot chocolate on a fall evening. Whatever the image you want to imagine and be inspired by, an outdoor rocking chair is all about comfort, fresh air, fragrant smells of nature and the quiet or bustle of the environment. Now, not every rocking chair is suitable for sitting on, just like any piece of furniture you have to enjoy it and make sure it suits your body. That is why I decided to try out over 50 different rocking chair options to find what I believe to be the best on the market. 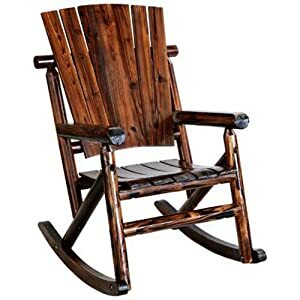 Remember, everyone has a different body and different associations, so my check was not performed alone, there were three of us, and we came up with the 14 best rocking chairs that we agreed upon. Which means, we all agreed that they were comfortable, sturdy and provided a nice gentle rocking motion that was easy to maintain. Essentially, we searched for material comfort, design, sturdiness and the ease of getting on and off, as well as rocking. So, without further ado, and with a good book, a nice cup of coffee and a croissant, settle back into your current chair and read on, after which, I suggest you buy that missing rocking chair that will make your life…sigh with enjoyment. There are a number of chair types, and this one is a folding, lightweight, zero gravity rocking chair that might seem flimsy, but is, in fact very stable and provides an excellent experience. The chair can support up to 250 Lbs and weighs in at only 17 Lbs. The Leg length is 33,” and the seat is 20.5” wide and 18.5” long. Now, why did we choose this one? Simple — it’s comfortable, portable, and economically viable. This means you can take it anywhere, anytime, and just enjoy it without breaking the bank. Bottom Line: The material used for the seating and backrest is a synthetic fiber that offers comfortable support, so you don’t need a cushion when you sit for a long time. This is a great advantage. 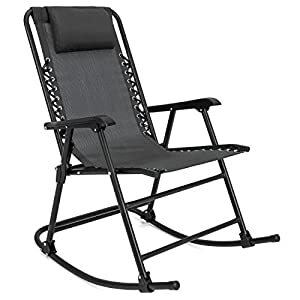 This is a great model to take on camping and picnic ventures, as well as having a few in storage for the days you have a lot of guests and you don’t want anyone to fight over who sits on a rocking chair. This is a designer chair, not the standard rocking chair, with a more modern look and thick square cushions that provide a lot of comfort. The material is a brown rattan, and the frame is aluminum. This seat dimension is 12.8” leg length, and the seat is 26.5” wide and 31” long. 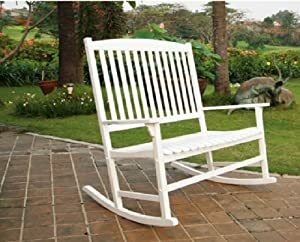 Bottom Line: This is a wide and comfortable rocking chair that will sit well on any patio or back porch. The synthetic materials are easily cleaned, and you should store the cushions when it’s rainy unless the chair is placed under cover. What’s really great is that the leg length is low, so smaller people can sit on it and have their feet closer to the ground. So, here we have an eco-friendly chair made of recycled wood, what they like to call Polyword. It is totally waterproof and designed to sit outside in all weather. The seat dimensions are 24” wide by 24” depth, and it weighs 42 pounds. Bottom Line: Since this is recycled wood, the resins and colors are added during the fabrication process, and therefore this chair doesn’t come painted, the color is already infused in the material. It’s a great chair and is very comfortable. It is weighted well, and the only additional one made was a small cushion for longer sits. We all liked the light look of this wood rocking chair. It has the classic design and has a wide 27.4” seat. It’s a high model too; the seat is elevated at 46”. The material used is actually eucalyptus wood, but they just state its FSC-certified solid hardwood. However, Eucalyptus is a great wood to sit on, and the 275 Lb support is proof of both design and wood quality. Bottom Line: The seat has nice curvature, so while cushions can be provided (by yourself), it is less hard on the posterior. The rocker itself is nice and smooth, and the overall design is really clean and stylish. This is all that you would expect from an outdoor rocking chair. Some rocking chairs are for patios and others for gazebos’ and hidden spots in a garden. 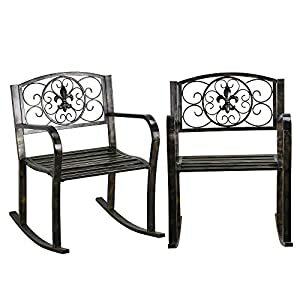 This pair of rocking chairs are made of iron with a bronze finish. They are heavy, strong and all-weather proof, and they support up to 250 Lbs. They look cool on a patio too, but the low back takes away from the overall comfort, that’s why we all decided that these were great gazebo rocking chairs. The chair has a 28.7” wide seat, which is really wide, so you have a lot of space to move around on even if you are padded in certain areas, and each chair weighs 46.6 Lbs. Bottom Line: They are iron, so get a cushion, even if the shape of the seat is great for rocking, metal tends to be cold to initial touch, or hot, if it was in the sun, so a cushion is a must accessory to this. While the back is lower than expected, the design is amazing, and we all marveled at how elegant and rich they look. These are great impression pieces. The Giantex outdoor rocking chair is good for indoors too. This is a hybrid chair that is made of wood, has an extremely wide seat which is 32.7”, and only weighs 14 Lbs while supporting up to 300 Lbs. This means that you are getting real value for money. The design is named simple-style, but in all honesty, there is nothing simple about this lovely chair. It looks the part and gives a really good rock. Bottom Line: What you would expect from a rocking chair; beauty, elegance, high back, and smooth rock. This is a very generous chair. Sometimes you have to sit on a hand-crafted chair to appreciate the workmanship. The Shine company handcrafts each chair, so they claim. When we sat on it, each one of us marveled at the simplicity of the design while enjoying the smooth rock and sturdy feel. This chair is made of wood with rust-resistant joints. which is important for a chair that sits outside. This is a great chair for even a humid, tropical environment. Bottom Line: If you like simple, then this is the one to get. The back was a bit too straight, no curvature for different lumbar support, but that’s fine considering the price. In fact, most rocking chairs only come with a shaped seat and a straight back, so this one fits in with our best choice models. 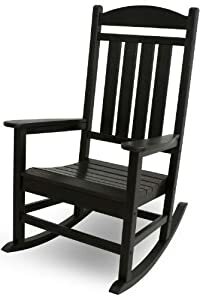 This is a standard painted wood rocking chair, the paint is polyurethane, which means its waterproof and thick enough to be initially scratch resistant. However, don’t scratch it, please. This model is a standard model, white and light, it has a wide seat of 34.35”, and the contoured seat is actually designed well, none of us needed a cushion, so that’s a big plus. Bottom Line: If its low budget and simple you want, then this is the one to get. Make sure you secure the joints when assembling. There is style, and there is Outdoor Interiors Resin Wicker rocking chair. Its made of Eucalyptus wood and has a very simple design with a medium back. Let’s start off by stating that this is a quality brand name. You are not getting some quick assembly chair from China. You are actually buying from a wood growing company that not only grows its own trees but manufactures its own furniture to design. Where to start, OK, the weight bearing is 250 Lbs, the chair weighs 30 Lbs, so already you are getting a great weight-bearing ratio for a solid and comfortable chair. The material is Ash wicker HDPE woven mesh. The seat itself is 21” wide, and it’s so comfortable we fought over who would take it home first. Bottom Line: If there is ever a rocking chair to rave over, it’s this one. This chair is so well designed, screams quality, made of all-natural materials and made with care. If you have one of these on your patio, you will forget what your lounge looks like. Seriously, you have to buy one to understand. When we talk of wood, the first wood we think about is Oak, and rightly so. Oak is the wood that history is built upon. Oak, hard, strong and used for everything from boats to buttons. 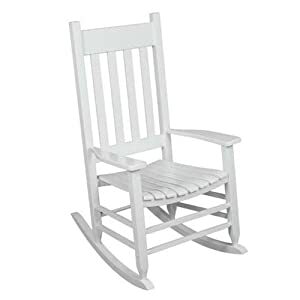 This is a 35” wide rocking chair with a contoured seat made of a friendly and comfortable material, Oakwood. Bottom Line: Indoors or outdoors, it doesn’t matter. This chair will rock you to sleep every time. We didn’t decide if we preferred it with a cushion since the seat is comfortable and the fact is Oak is a great wood to sit on. Now it’s time to get all funky and frontiers. Yes, if you want that centerpiece item to talk about, and even build up an old legend that your mama’s great-great-grandpa sat on this very seat during the Boston Tea Party, you might actually get away with it. The design is really retro, in this case, retro back to the 18th century. It has a fresh light wood finish gives it a really clean and refreshing appeal. It supports up to 205Lbs, and the seat width is 27”. It looks heavier then it is, and only weighs in at 24.5Lbs. Bottom Line: This is a natural finished hardwood that gives you a bit more style with your comfort. If you put this on your patio, family member sill fight over who sits on it. Believe me. 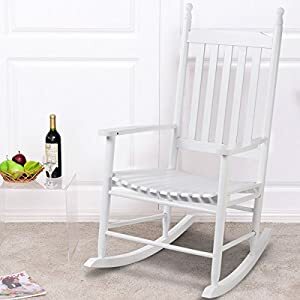 If you are a romantic, or you just hate the quarrels over who sits on the rocking chair, then either get two or be even smarter and buy this tandem (double) rocking chair. This white outdoor version is perfect for a family patio. It is made of hardwood painted with durable plastic paint and the chair supports up to 550 Lbs, so no worries. Bottom Line: This is a fun seat, we mean it, we all took turns sitting together, and it’s a real treat to families that want to share. Do you remember the item number 11 reviewed here, well this is the old worn looking version, and we mean it the best way! It is superior in design in our opinion, but then the design is personal, so you can either enjoy the fresh, natural look or this amazingly varnished, waxed look. This beautiful retro rocking chair is made of cured hardwood, with a dark varnish added to give it that really ancient and hard look. This is the talking piece of the area; when you see it, you have to sit on it. It’s time to finish this review with a home-grown rocking chair The Trex is a no-nonsense clubhouse rocking chair. Which means its designed to look good anywhere. This is a plastic chair with stainless steel joints, so it’s 100% weatherproof. We kept this for last since its plastic, which makes it different from the rest. It’s durable, easy to clean and doesn’t warp after a few seasons. It’s also commercially made, which means its made for a lot of wear and tear. Hence the name, Yacht Club Rocker. Bottom Line: With its comfortably wide seat of 33.75” and smooth rocking motion, this chair was made for both commercial and residential use. Personally, I prefer wood, but I have, and retail store near the bay and this is a great customer attraction point. You know when you see the morose-looking man watching his partner shopping? Well, give him a rocking chair, and this will make sure his partner buys out the shop! 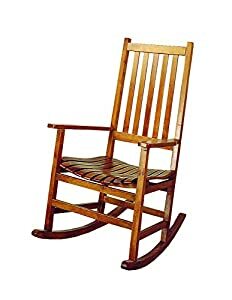 What is a rocking chair? Well, that’s simple, it’s a chair that rocks! Seriously, it’s a chair that has four legs connected to a curved brace that allows the occupant to rock steadily and safely. A rocking chair is not as easy to design as you think, you need to consider weight, the center of gravity, focal points and speed as well as safety. Once a rocking chair fabricator has mastered the art of designing and constructing a safe and smooth rocking chair, the next item on the agenda is style. These are the originally designed chairs that come with four legs on a curved brace. The materials used can be anything that you find lying around, and they can come in many shapes and sizes. All they need to be are sturdy enough to carry weight, curved correctly for a smooth and easy rock, and weighted with a center of gravity that does not lead to an accident. These rockers come with a stable or solid base, unlike the rocking chairs’ two-ski approach. The platform rocker provides a bit more stability on uneven surfaces and is considered to be more senior citizen and infirmed friendly. You know how we humans love to complicate matters? Well, we do, and so many like to fix things that are not broken. Including the design of a gliding rocking mechanism that complicates the chair but makes for a very interesting experience. In fact, platform rockers are perfect for the indoors since the outdoors environment can play havoc with the mechanism (metal corrosion). They are more stable, and safer than a standard rocking chair, but more expensive too. They come with a locking mechanism, so many nursing mothers prefer this type to a standard rocking chair. 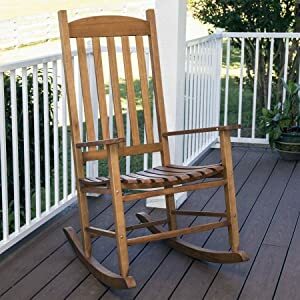 So, what is the difference between an outdoor and indoor rocking chair? An outdoor rocking chair takes into account the environmental conditions, while an indoor one will be designed for maximum comfort and the fact that the indoors is dry. 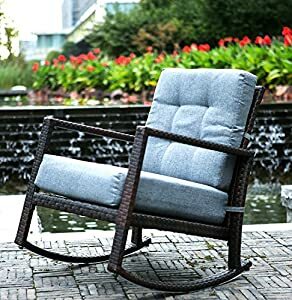 Therefore, outdoor rocking chairs will not come with cushions or pads built in; these are usually added on for comfort. They are made of weatherproof materials, with coatings and linings that will not rust, or transfer moisture. Another structural difference is that the material used for the frame must be more durable to scratching and easier to clean. 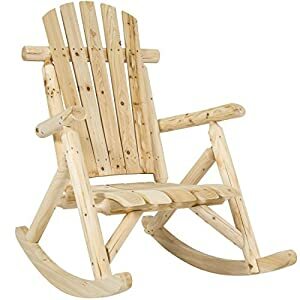 Why buy an outdoor rocking chair? Outdoor rocking chairs are great seats for nursing mothers, relaxing seniors and kids seeking a thrill. They are great for reading a book, watching the horizon and just sitting and falling asleep. Rocking chairs have been proven to aid in stabilizing emotions and calming down nerves. Another great feature is that they attract people to sit on them. This means that if you have one, there will be arguments, so it’s always good to have two rocking chairs around for allaying quarrels over who has dibs and who was first. The rocking motion is also a great addition to any calming discussion, and guests enjoy a glass of wine while rocking gently and talking about whatever. Where do you want to rock? There are a number of outdoor locations, and generally, they are either front porch, back patio, by an inground swimming pool, in a gazebo, in a garden, in a hidden place. The difference in location takes into account two key issues: Is the chair under the open sky and is it on solid ground. Based on these two questions, you will need to consider materials and rocker stability. Once you have your location, how much space do you have? 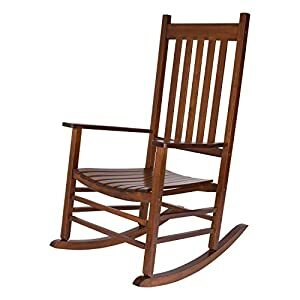 You need to decide how big your rocking chair is, and whether you need one, two or a double rocking chair. 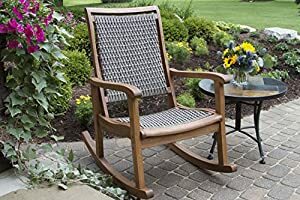 There are many purposes for an outdoor rocking chair and should consider whether it is for entertaining guests, sleeping, nursing babies, letting kids play, for senior family members, for your pet. Perhaps you want to take it with you when you go camping or on a sports or picnic outing? Whatever the purpose or purposes, match the chair to the user. This means chair size, and height from the floor, as well as the rocking mechanism. Now that you have decided, where, how big an area and who will use it, you have to factor in how often it will be used. Is the chair going to be like that walking machine, a large coat hanger? Or is it going to be in constant daily use, hours a day? The frequency of use demands a sturdier model and stronger materials. Once you have ascertained what chair model group you want to buy, its time to compare the different features that are used to construct each chair. There are three main material groups to choose from: metal, Wood, and Synthetics. Whatever material you go in for, make sure it is rust-proofed and easy to clean. Outdoor chairs get a lot of environmental damage, direct sunlight, hot humidity, cold dew, rain, and snow. Add to this dust and wind, and you need a chair that can withstand nature 24/7. Who will sit on the chair? Are you slightly overweight or more? Consider the width of the seat. If you have short family members, consider the height of the seat. Do you like to rest your head? Consider the height of the back. There are traditional, retro, modern. In fact, there are as many designs as you will find in furniture as a general guideline. 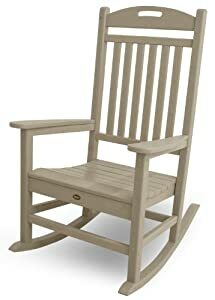 As a general rule, rocking chairs come with a hard surface. The portable (foldable) ones come with fabrics. If you are buying a solid chair, consider adding a cushion for the seat and back support, these add to the comfort level and give you longer hours of rocking comfort. Footstools are also an option some consider adding, and side tables that can lock onto the arm-rest are a fashionable item, just make sure you don’t rock with a drink. As with any item of furniture, there are different levels of quality, brands to choose from and materials to consider. Each one comes with a different price range. However, there is a rule of thumb; cheap is too expensive to buy. This means that if you buy something that is really cheap compared to all the other products don’t be shocked if after a year or two it falls apart. Rocking chairs are meant to withstand constant mechanical use, so make sure you buy one that is within your budget, and this means it won’t cost you more to replace it sooner than later. When buying online, remember that the chair will most probably come in kit form. This means you will get a box containing all the parts and pieces for assembling, including tools. Before you buy, make sure what is in the package, and how easy it is to assemble. You don’t want to buy a chair that every piece of wood needs to be assembled. You want a package that has most of the parts assembled, such as the back, armrests, and rockers, leaving you with a few locking actions that should not take more than 30 minutes. Also, make sure you get the assembly directions, you don’t want to buy a 3D puzzle. Make sure you buy from a reputable firm, or from a site that has a good number of reviews, or a product that comes within a review (like this one). The last thing you want to buy is a cat in a sack. Safety is a major issue, so you need to be assured that the chair you are buying is made of reliable materials, the assembled item is sturdy and can withstand the claimed load bearing, and that the materials are treated, coated and made of all-weather resistant materials or surfaces. A rocking chair is a must for any home, whether you have access to outdoors or not. If you have an outdoor patio, porch, garden, backyard or even complex, populate it with a rocking chair. The bigger the location, the more rocking chairs you should provide. Consider one rocking chair per four people as the minimum ratio level.